The 65.2 metre sailing yacht Lamima has been listed for sale by Adam-Michael Papadakis at Camper & Nicholsons. Custom built in Indonesia using traditional materials (ironwood for the hull and teak for the superstructure) to a design by Marcelo Penna and MCA classed, Lamima was delivered in 2014 as a Phinisi sailing yacht aimed squarely at the charter market. Accommodation is for as many as 14 guests in seven cabins consisting of a main-deck master suite with four doubles and two twins below, all with entertainment centres, flat screen televisions and en-suite shower facilities. In addition, there are quarters for 20 crew aboard this yacht for sale. The crew include a dedicated tour guide, two experienced Indonesian chefs, two Balinese masseuses, a yoga instructor and two qualified dive masters, ensuring that guests make the most of the turquoise waters of the Indonesian archipelago. Her saloon is situated amidships on the main deck. This spacious indoor area is furnished with a bar and lounge as well as a dining alcove designed to comfortably seat all 14 guests. The upper deck, extending forward of the pilothouse, is furnished with Indonesian sun mattresses and dedicated to relaxation. With over 1,200 square metres of sails and a 1,000hp MAN diesel engine, she cruises at 10 knots and can reach a top speed of 12 knots. 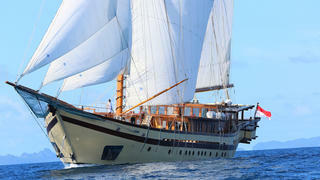 With an excellent charter record behind her, Lamima is asking $18,000,000.